Darren Campbell refused to join his team-mates on a lap of honour after Britain's 4x100m victory at the European Championships. Campbell did not want Dwain Chambers in the team following his two-year ban for taking the steroid THG, according to newspaper reports. The veteran sprinter told BBC Sport: "I've made my situation clear. I just can't take the rubbish any more. "I'm not a hypocrite. How can I do a lap of honour?" Campbell shook only Marlon Devonish's hand at the end of the race, according to the Guardian, and waved away Chambers and Mark Lewis-Francis. 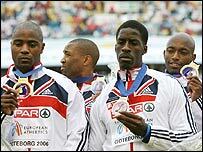 The British team had reclaimed the gold medal they won in 2002 only to be stripped of it following Chambers' admission that he had taken performance-enhancing drugs. UK Athletics performance director Dave Collins said: "They had a meeting [before the event] and Darren wasn't happy, but said: 'OK, let's get on with it.' I don't know what's happened since." Chambers said: "Darren doesn't bother me. He hasn't said anything to me personally. I was told I could run the relay if the rest of the team were happy for me to run. I apologised to them on the warm-up track two days ago." Collins defended the decision to include Chambers, who is not eligible to run at the Olympics because he is a convicted drugs cheat. "The rules are the rules," he told the Times. "If the rules of the sport were to change I would not have a problem with that. It is a very vexed question and I do not think it is as simple as black and white. "But it is a difficult decision for me because what I am running is a programme that is focused on success at Olympic and world level and the decision to select any athlete anywhere who is ineligible for the Olympics is a big and complex decision." Campbell added that he was disappointed to have "certain accusations thrown at me because I take part in a team that I have no control (over)". Pressed on what the accusations were and who had made them, Campbell said: "Read the papers. I've made my situation clear. "If everyone else wants to blow a little smoke over it, that's up to them. Hopefully everyone's happy now - they've got their gold." Asked if he was going to retire, Campbell, 32, said: "You're damned if you do and damned if you don't. I've done what I always do and run for Great Britain." Campbell's team-mates hinted that they knew what his gripe was, but were not prepared to divulge. "He had his reasons for going off, but I can't vouch for him," said Chambers, who ran the first leg. "He's obviously hurting, but he'll give his opinions at his given time." Darren let himself down badly there and I'm sure he'll look back on this day with regret! And Mark Lewis-Francis, who brought the team home, denied there was any discord in the British camp. "That's nowhere near the truth," said Lewis-Francis. "We've bonded together and I don't know where the negativity's come from." BBC pundit and double world-record holder Michael Johnson said he was not surprised at Campbell's outburst and urged the British public not to let it overshadow the rest of the team's achievement. "I think that's what Darren wants," said Johnson. "Here we go again - I'm not shocked, I'm not surprised, but I'm disappointed. "The fact that Darren came over to get an interview while everyone else is taking a victory lap means he wants to be the one guy by himself. "If he feels really strongly about something, let's not hear about 'certain accusations', let's hear about who it is. "Because people at home are wondering what's going on and wanting to know what the problem is. Obviously there is one."